Following the Leader series, our product developers present the dddrop EVO Twin. With this plug & play 3D printer, which has been developed over the years on customer feedback, are you ready for the future. 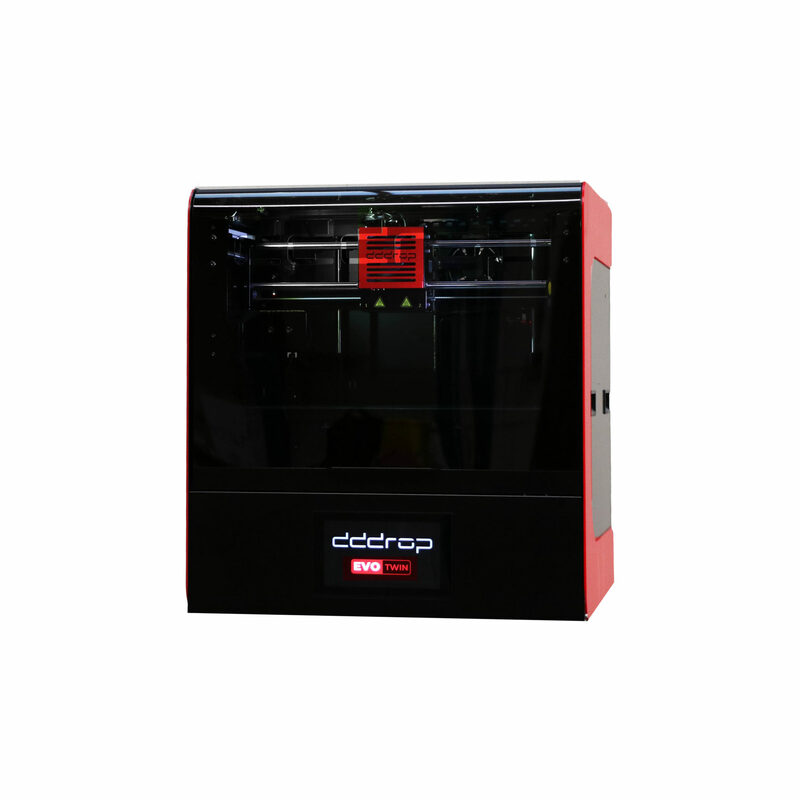 The dddrop EVO Twin is a beautifully professional 3D printer with a huge printing volume, focus on functionality and has a significantly increased build speed compared to the previous model. The 7 inch full color touchscreen, the upgraded printer control together with the next generation computer processor unit makes the printer easy to operate. The dddrop 3D printers are developed and manufactured in the Netherlands and offer many possibilities for their attractive price. The printer has an open filament system, giving you the free choice of material. The closed, climate-controlled chamber together with the swappable high-temperature print bed enables perfectly printing high-tech materials with stricter temperature requirements. Thanks to the active cooling of the swappable print bed, complex models and completely bridges can be printed perfectly. The swappable print bed ensures that you can immediately continue with the next print. 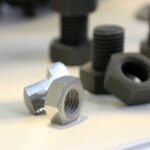 The two independent nozzles (print heads) enable the use of soluble supportmaterials for the successful printing of virtually any complex part. The unique design of the nozzles prevents clogging. The dddrop offers the right nozzle for every job: super detailed or super-fast. You can choose from the print heads: 0,2 – 0,4 (standard) – 0,6 – 0,8 – 1,0mm in brass, stainless steel or tungsten carbide and you can change them in under a minute. The great advantage of the dddrop EVO Twin is that it is a fully integrated SMART device, so you can operate your printer via LAN and / or WiFi from anywhere in the world. Print your models at any location without sharing your models or files. Furthermore, the EVO Twin gives a notification when it’s out of filament, a huge advantage when printing expensive materials. The dddrop EVO Twin, works with dddrop filament and settings for Simplify3D slicing software which can be downloaded via the dddrop support page. You can design your own models or download 3D models from the web. Within minutes you convert your 3D model into a print. Are you looking for a professional 3D printer that perfectly print with high-tech materials as ABS, PET-G, Metal or Carbon? Print with two materials? For larger and smaller products? Full control and the best helpdesk? The dddrop EVO Twin it offers you all! Find the dddrop EVO Twin in our online shop. Control your 3D printer with your mobile, tablet or pc. Built-in camera to monitor the printing process. Watch, pause or stop your print, worldwide! Adjust all printing values live during printing! You choose for a local (Wifi/LAN/USB) or web connection: super-safe or super-flexible! Receive notifications at different stages of the printing process. Receive notifications about your filament status (out-of-filament or entangled filament). Live support from our support engineers. With the Smart Module you control the dddrop Leader PRO 3D printer with your mobile, tablet or pc. The free app finds every Smart dddrop 3D printer in your network or make a connection with the Cloud. It has all the connectivity you can wish for: WiFi, LAN, Hotspot and USB. This way dddrop makes 3D printing as easy as possible for the user. You just choose a file and start the print job. 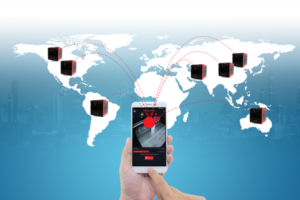 The Smart Control allows you to print on a dddrop printer anywhere in the world: You can produce it at your customer location while keeping your models/files encrypted and safe! The Smart Module will have more and more functionality by automatic updates. Filament Management, the dddrop way! No more loss of 3D prints, because of filament-issues. 100% use-up your filament reels! Print large 3D models without interruption, using automatic switch option! Fully integrated with the dddrop Smart Control: Notifications and settings. Open system: Works with any filament brand! The module detects filament-entanglement or out-of-filament. If this is the case, your 3D printer will pause and send you a notification. You can change the filament anytime, while the 3D printer remains at temperature. You can resume your 3D print after you solved the filament issue. It is also possible to switch automatically to the second print nozzle/ filament role and continue printing: This is done automatically and unattended. The Filament Management Module is cost saving, because you simply do not waste any filament and no more loss of your 3D models due to printing in the ‘air’. Thanks to the Filament Management Module you can re-use and finish your old stack filament rolls completely. Besides saving costs, it is also time saving because there is no loss of 3D prints by filament problems. BASF developed an new filament: Ultrafuse 316LX. This filemament is more than 80% filled with metalpowder (SS) but still very flexible. The process is comparable with MIM (Metal Injection Molding), but the material is not in powder but filament shape. With this filament you can indirectly 3D print metal components. De steps to finish the parts are equal to MIM: De-binding and sintering. 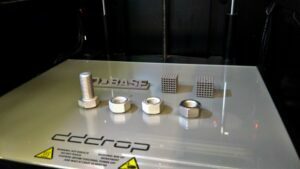 dddrop 3D printers are used in the developement of the filament and dddrop will bring a metal-kit, bed and nozzles to allow the users to print full, stainless metal parts at an incredible cost-level. Features Dual printhead (twin): up to 300°C. Smart: Remote control via phone/tablet app or browser from anywhere in the world, printing via USB/WiFi/LAN. Filament Management: Automatic switch to a full reel when out of filament for continuous printing or pause and messaging on filament problems. Never lose a print because no filament or entangled filament and always use up your entire reel! Temperature controlled print room: Fully controlled print room keeps warping at bay, especially useful when printing more high-tech materials. Swappable buildplate: Swap your buildplatform easy for different printjobs and materials.